We’d love your help. 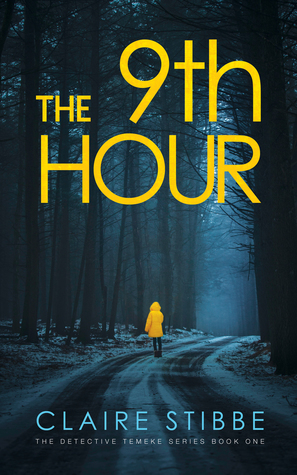 Let us know what’s wrong with this preview of The 9th Hour by Claire Stibbe. The Duke City Police Department in Albuquerque, New Mexico is no stranger to gruesome murders, but this new serial killer on their block keeps the body parts of his eight young victims as trophies and has a worrying obsession wi When the ninth young girl falls into the clutches of a serial killer, maverick detective, David Temeke, faces a race against time to save her life. To ask other readers questions about The 9th Hour, please sign up. This portion of text is not a spoiler, it was something that stayed with me after I finished the Ninth Hour: one of the more “normal” passages in this horrific tale that kept me transfixed, reading every page even though I was often sickened by the details and the psychopathic deviance of the mind of the serial killer. Claire Stibbe created a masterpiece when she plotted this dark crime thriller. Her writing is richly descriptive, taking the reader into the mind of each of the characters, good and evil, portraying their inner struggles, their weaknesses and their strengths and the single minded determination that makes each one of them believable; Detective David Temeke, and his partner, Detective Malin Santiago, Darryl Williams the bereaved father of the youngest victim, Morgan Eriksen and Ole Eriksen (the “brothers” who shared a terrible secret), and teenager Tess Williams, the last of the nine girls chosen to face the Ninth hour, the one who fought to the end. While I was truly disquieted by the horrors that the killer perpetrated upon his victims, by the end of the book I began to fathom how he had become so twisted. Few people would be born that way, but betrayal and staggering loss sometimes creates a monster. This book is highly recommended for anyone who enjoys a face paced, convoluted, dark crime thriller, but it is not a read for the faint of heart! Whoa, this thriller had me on the edge.
" The man walked to the edge of the wood swinging a steel forged axe. Blood dripped from the blade and left a sticky trail in the dead brown leaves..."
A serial killer, who believes he has to behead nine young girls to fulfill a Norse legend. The killer is smart, cunning, ruthless and of course, sick in his head. "... When he took life, it was only to resurrect that which Whoa, this thriller had me on the edge. "... When he took life, it was only to resurrect that which was cruelly taken from him. It was a power he secretly loathed, as if someone had thrown a switch that could never be turned off. There were no witnesses, no first-hand accounts. That was the beauty of it..."
The only girl who gets away is Becky Morgan. This book is not a read for the faint of heart. A few times I actually wanted to put it away but I had to know how the killer (Ole) gets caught. On the hunt - Detective David Temeke and Malin Santiago, the squad’s newest recruit. Their heads end up in a commercial fridge. The killer is so sick, so heartless, he makes Mafiosos look like "nice and just people." The crimes are disgusting. The readers cannot help but fevering for the detectives, hope that they will decipher the many clues correctly. "... “He’ll keep killing unless we find him,” he said, trying to keep his mind on the matter. “One a month, just like he promised.” “Got any leads?” “Not unless the doctor comes back with a match. Incidentally, I found a nice little gift on my doorstep this morning. A thigh bone. Human. It’s on the backseat if you want to take a look at it.”..."
About the only predictable part of "The 9th Hour" is that I guessed that Ole would be able to grab Malin Santiago. No spoilers from this reviewer but a promise that this book will keep you on the edge. This has to be the best thriller I’ve read in recent times. From the opening page and a bloodstained axe, the author delivers a succession of scenes that are so compelling, there was no way I could put the book down. Forget all those whodunits with formulaic plotting, this one will turn you inside out as you follow Detective Temeke and his new partner on a twisted and terrifying journey to capture a crazed Norwegian serial killer. With its unsettling Nordic, noir undercurrent, and wild New Mexic This has to be the best thriller I’ve read in recent times. From the opening page and a bloodstained axe, the author delivers a succession of scenes that are so compelling, there was no way I could put the book down. Forget all those whodunits with formulaic plotting, this one will turn you inside out as you follow Detective Temeke and his new partner on a twisted and terrifying journey to capture a crazed Norwegian serial killer. With its unsettling Nordic, noir undercurrent, and wild New Mexico setting we are plunged headlong into a worst nightmare situation as the disturbed killer seeks to gather nine decapitated heads to fulfil a Norse legend. The writing is superb, allowing us to alternately glimpse into the mind of the disturbed and damaged killer, while championing the pursuing detectives, and grieving with Daryl the heartbroken father of one of the victims. It’s a heady concoction which adds to the suspense as the author winds it up one ratchet at a time to a climatic finale. Fast paced and packed with tension, this is an intelligent, superbly crafted thriller which I wholly recommend. Great psychological crime - I can’t wait for Detective Temeke Book 2! ‘The 9th Hour’ oozes urban crime and corruption in a race against time to find the serial killer whose MOD is cutting off heads and who has an obsession with Norse Mythology. C.M.T. Stibbe’s new detective series brings Scandinavian psychological tension to New Mexico’s seedy bars and savage forests. Detective David Temeke is as much an outsider as the criminals Great psychological crime - I can’t wait for Detective Temeke Book 2! C.M.T. Stibbe’s new detective series brings Scandinavian psychological tension to New Mexico’s seedy bars and savage forests. Detective David Temeke is as much an outsider as the criminals he chases and his partner Malin Santiago adds just the right amount of unsettling personal chemistry to the mix, as well as her own professional agenda. An assured page-turner that leads inexorably to a satisfying conclusion. I can’t wait for Detective Temeke Book 2! Got through eight pages. I never knew what the author was trying to say. His attempt at snappy, believable dialogue were sentence fragments which didn't seem to relate to the previous sentence. I hated all eight pages. I refused to do it. I deleted the blasted thing. I really and truly tried to get into this book. However, it was very boring and written in a very disjointed manner. I got halfway through and then finally gave up. It was written in such a way that it just couldn't hold my interest. Just not my cup of tea. I like thrillers, but I never got into this. Tameka seems like a nice enough guy, we do get to know him a bit. The story is ok. But somehow I never took to any of it. Can't put my finger on why I didn't, because I really wanted to like the book. Somehow it's disjointed, lacks cohesion. Like the part about his wife, few mentions, could be good, brushed over. And the last bit, the endless chase part, just went on way too long. However, that is personal opinion, as I don't e Just not my cup of tea. I like thrillers, but I never got into this. Tameka seems like a nice enough guy, we do get to know him a bit. The story is ok. But somehow I never took to any of it. Can't put my finger on why I didn't, because I really wanted to like the book. Somehow it's disjointed, lacks cohesion. Like the part about his wife, few mentions, could be good, brushed over. An OK read. Not bad enough so I didn't finish reading it, but not good enough to make me want to read more of the series. It felt like the author was trying to shock the reader to draw them in, but didn't support it with strong writing. The main character was very cliché and overall characters didn't feel very developed. You know who the killer is pretty early on so it kind of took away some of the intrigue. I found myself losing interest quite often. The writing didn't keep me wanting more. Couldn't get into the characters at all. I finished it but I can't say it was truly enjoyable. If I wasn't working on a book challenge, I would've just left it. The idea is good, but everything from the murdered, plot, detectives, is bad. The characters are jumbled and their backgrounds have too much elements that don't fit. The story is only piling together as it goes along, with more and more details being added that seem like an afterthought to add more complexity and no sense to it. I was disappointed and outraged from the middle of the book till the end with so many cliches. I found this book very confusing from the beginning. I did not enjoy the writer's style of writing, it jumped about too much, sometimes even within the sentences so that I found it very difficult to follow. I don't think I shall be bothering to read any more books in this series. I really didn't get the connection between New Mexico, a British detective of African origin and a Norwegian killer? Too much confusion. Story was so-so, can't say I'd recommend or read another by this author. The storyline was good, but I really struggled with Claire's (author's) writing style, it didn't seem to flow and I couldn't fit all characters in easily, often having to re-read sections. “The ninth hour” is like no book I’ve ever read. It could easily be characterized as a serial killer story or perhaps a story of ritual murder. But no matter hard I tried, I couldn’t come up with an easy categorization. My first impression was “film noir”. Not that this book reminds me of Fred MacMurray in Double Indemnity, but there is an abiding darkness to this book, a strong sense of the underbelly of life. There is no break in the tension and very little humor or down time from the disturb “The ninth hour” is like no book I’ve ever read. It could easily be characterized as a serial killer story or perhaps a story of ritual murder. But no matter hard I tried, I couldn’t come up with an easy categorization. My first impression was “film noir”. Not that this book reminds me of Fred MacMurray in Double Indemnity, but there is an abiding darkness to this book, a strong sense of the underbelly of life. There is no break in the tension and very little humor or down time from the disturbing tone that Claire Stibbe manages to skillfully maintain throughout the book. David Temeke is a detective with the Albequerque police department. While this is interesting in that Albequerque is not a common location for detective novels, Stibbe takes this one step farther. Temeke is a British son of African immigrants to Britain. His reputation as a detective is impeccable and his is considered an amazing interrogator. In keeping with the dark tone of the story, Temeke is a tough police tsunami, but he is addicted to weed and his relationship with his wife is less than stellar. Throughout the story we are given small windows into Temeke’s personal life and it enhances the sorrowful and hopeless feeling of the book. In the world outside his personal life Temeke does what he does best; he is fully absorbed by every bit of pain, anguish, and psychopathy of police work. In “The Ninth Hour”, he is chasing a serial killer whose MO is deeply rooted in the legends of his homeland, Norway. For this serial killer, a perversion of Norse mythology guides him in his murderous activities. For Ole, he needs to collect heads for Odin. Nine female heads. Stibbe creates fascinating characters. Ole is a remorseless serial killer but he has elements of a lost child and at times craves love and acceptance. As he executes his reign of terror, Ole taunts whoever he can, establishing himself as an alpha male. From the father of one of his victims to detective Temeke himself, Ole sets up situations where he can threaten and bait everyone he considers his enemy, threatening their lives in the process. Risk is not an issue to him, only his ability to control situations and prove his superiority. Part of the dark tapestry is Temeke’s new partner. Malin Santiago is a woman with a past that she is not proud of. Now a policewoman, her past surfaces in a number of ways, much to her chagrin. Like all of the primary characters in “The Ninth Hour” there is sorrow and shame in Malin’s life. What is interesting and gratifying is that Temeke takes her under his wing and helps shield her from ridicule. There is an excellently developed bond between the two, expressed in subtle almost emotion averse style that characterizes this story. All in all Stibbe is expert at creating a dark hopeless landscape without taking it too far. The prose is poetic as she describes the beautiful landscape of New Mexico and the characters are fully developed and fascinating. For fans of dark “noiresque” detective fare, this book will provide an excellent read. Detective stories have been among my favourites ever since I can remember. This book is the first in a series, so, although its lead detective Temeke is quite an acquired taste, burdened with plenty of faults and not many likeable habits, his pitbull-like persistence and dedication might just make you a fan and follower of his further cases. Although my personal favourite would be his assistant partner Malin, as I found her more relatable at times. It will be interesting to see them grow in furt Detective stories have been among my favourites ever since I can remember. This book is the first in a series, so, although its lead detective Temeke is quite an acquired taste, burdened with plenty of faults and not many likeable habits, his pitbull-like persistence and dedication might just make you a fan and follower of his further cases. Although my personal favourite would be his assistant partner Malin, as I found her more relatable at times. It will be interesting to see them grow in further books. The crime in The 9th Hour is a series of particularly gruesome killings of teenage girls, with much to stomach - at one point it reminded me of The Silence of the Lambs. The author displays a veritable knack for telling parts of the story from the killer's point of view, and, as disturbing as they may be, they impressed me the most. The villain is vile and fascinating, powerful and disgusting. His victims are shockingly naive, yet perfectly plausible, and not all of them what he expected them to be (yay!). It is a risk for an author to let us know who the killer is from the start and then let us wait it out to see how, when or if he will eventually be caught, but intriguing and engaging just the same. Like me, you might find yourself having all these brilliant ideas on what you would do and who you would call; you, that is, or any other famous detective you've already met/read. But Stibbe makes the detectives painfully human and susceptible to mistakes, just like the rest of us. Temeke and Malin are given no superhero powers, extraordinary abilities or phenomenal gadgetry and financial support to solve the crime. At times, even their own police department is a questionable resource of support, be it due to resentment, envy, laziness or mere inability to fathom the extent of malice in the crime itself. What is memorable, especially in the final showdown, is their tenacity, persistence and a sheer need to catch this mentally brilliant and emotionally damaged killer, also a fallible human being but unpardonable. I admit: I only read - or should I say fought my way through - half of it before finally giving up. This is the first book in a series, but I never lost the feeling that I was missing something vital which was explained in previous books, as if this one was part of a series where you needed the previous books to understand what on earth was going on. The characters: no background information, nothing regarding what makes them tick and who they are. The plot: okay murdered girls, about 7 of them, I admit: I only read - or should I say fought my way through - half of it before finally giving up. This is the first book in a series, but I never lost the feeling that I was missing something vital which was explained in previous books, as if this one was part of a series where you needed the previous books to understand what on earth was going on. The characters: no background information, nothing regarding what makes them tick and who they are. The plot: okay murdered girls, about 7 of them, but no explanation whatsoever on what happened before, there is a suspect all of a sudden, but nothing about how they got to him, why he was a suspect, or how the person giving the information about him was related to him, or to the case. The narration style: sorry, boring boring boring. One can tell that the author is familiar with the area,and for those of us from Albuquerque, that makes it fun. But it also causes us to find the mistakes. Maples are only found in 4th of July Canyon, which is on the east side of the Monzano Mountains, not any where near Cimarron. Stags are deer. Male elk are bulls. Does are deer. Female elk are cows. Shelby barn, not the Toby barn. Loved this book. The characters were a little bit difficult to imagine as I don't think their descriptions were that clear. Also the interactions between the two main characters, Temeke and Malin, was a bit difficult to understand. Also, Temeke says repeatedly that he is married however that relationship is weird as well. The story line is interesting and comes together at the end rather nicely. A good suspense novel that was enjoyable. This story keep me on the edge of my seat. I kept wanting to know what was going to happen next. Ole was a horrible, sick human being, but he was also good looking and a smooth talker. It was easy for him to get the girl's attention and too easy for him to kidnap them. I really thought he and Morgan were twins. The characters are credible and I enjoyed the changing POV, delving into their thoughts and emotions. The first 2 or 3 chapters drove me crazy, though, because everything is thrown at the reader all at once. I had to reread them to follow who was who. Another weird thing Stibbe does is run the time and location changes together without line-breaks. Really confusing. This book surprised me as at first I felt like giving up on it as it seemed a bit disjointed, but I went back and started again. I was pleased I did as the more I read the more I wanted to read, just goes to show never give up on a book. It's not a book for the faint hearted as it's quite gory in places.Will be looking for more by this author. I had a bit of trouble getting started with this book. I'm not terribly fond of the characters, who I assume will continue to show up in future novels, so not sure I will read another in this series. I finished it only because I don't like to leave things undone! A serial kliler, nine young girls, a British detective in New Mexico. Flow is choppy, Characters are indefinite and introduced piece meal. Had to force mystelf to continue reading by taking frequent breaks which added even more to the choppy flow of the story. Winner of the New Mexico/Arizona Book Award and two time finalist, Claire Stibbe writes crime thrillers set in the US. She is also a reporter for Stand True 4 Blue dedicated to law enforcement, a member and graduate of the Citizen Police & BSCO Sheriff’s Academy. A former journalist and magazine editor, she lives in Utah with her husband and son. Find out more about Claire at www.clairestibbe.co Winner of the New Mexico/Arizona Book Award and two time finalist, Claire Stibbe writes crime thrillers set in the US.